The vampiric lords of the Long Night claim supremacy over medieval Europe - and yet they keep to their castles and cathedrals, worriedly watching the forests between. For great wolves hunt the wild places and pace the roads, and howls of anger echo across the moors. By day they walk as humans - and when the moon rises, their hunt begins. They are the werewolves fo the Dark Ages. Rage Across the Long Night? 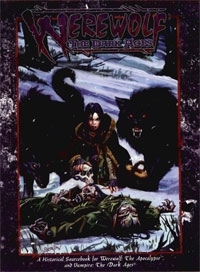 Werewolf: The Dark Ages is a supplement allowing Werewolf: The Apocalypse players to explore the medieval World of Darkness from the Garou's point of view. This book contains just about anything you could want for adapting werewolves to the Dark Ages setting, from information on the tribes of the time to guidelines for crossing over with Vampire: The Dark Ages. Whether you want to try a completely different spin on medieval horror fantasy, recreate the deeds of your modern-dayGarou's ancestors, or even give the Lupines in your Vampire: The Dark Ages game some real teeth, this is the book for you. Note that this book is now outdated. Check out the new V20 version. Do you mean the Dark Ages Revised version?